WITH a 68 percent decrease in fireworks-related injuries, the Department of Health (DOH) declared a “historic” reduction in the number of those injured in welcoming the new year. DOH Secretary Francisco Duque III said in a press conference that there were only 139 cases reported nationwide from December 21, 2018 to January 1, 2019 (6AM), as compared to 428 cases during the same period of last year. “We are happy to see a 68 percent decline in the number of cases,” Duque said. “I believe this is a historic, biggest reduction in the number of firecracker injuries,” he added. Of the 139 cases, the DOH said 137 were injuries from firecrackers, while the other 2 were cases of fireworks ingestion. There were no stray bullets and deaths reported, added the DOH. The health chief attributed the decrease in cases to the rainy weather that prevailed in the country in recent days. “Nature took the side of the DOH as it has been raining the past several days unrelentingly,” said Duque. Still, the DOH head said they remain vigilant over the possibility of more firecracker injuries being reported in the coming days. “Most additional injuries during this time may arise from children picking up unexploded fireworks in the streets,” said Duque. Majority of the cases were found to be males at 81 percent; while the age range is from 2-69 years old. Most injuries were blast/burn without amputation with 102, while blasts with amputation accounted for 5. Another 36 cases were eye injuries. Firecrackers that caused the most injuries are Kwitis with 30, Boga with 16, Piccolo with 15, Luces with 8, and 5-star and triangle with 7 each. Asked for the reason why Piccolo has been dislodged from being the top cause of injuries after several years, Duque cited the reduced supply in the illegal firecracker. “On the supply side, the Piccolo, which is an illegal firecracker, saw a dwindling number,” said the health chief. In turn, Duque noted that the number of Boga (PVC cannon) injuries rose. “The creativity of Filipinos took over when those that cannot use Piccolo turned to Boga,” said Duque. 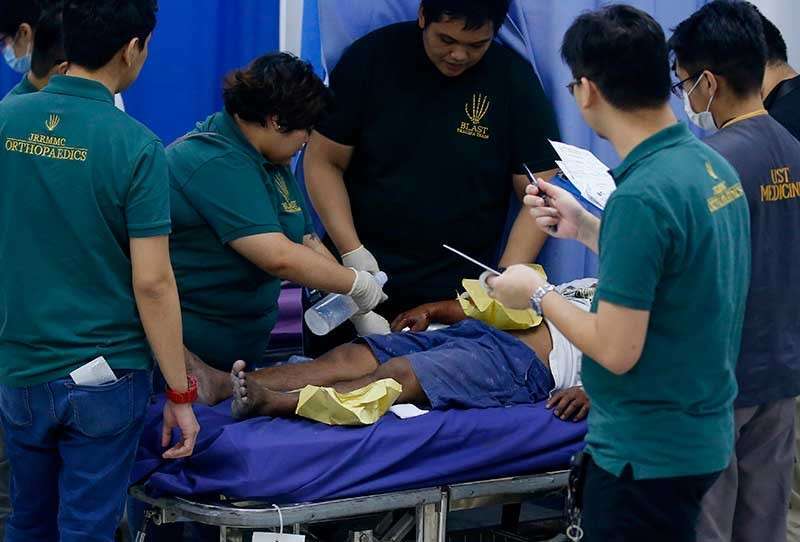 The regions with the most number of injuries are the National Capital Region (53), Western Visayas (26), Central Visayas (13), Central Luzon (10), and Calabarzon (10). Most injuries also occurred in the streets (73), followed by those at home (59), while 2 happened in designated fireworks display areas. Duque said it was in Manila and Batangas fireworks display areas where the cases were reported. “It was definitely a setback because we have been encouraging people to go to fireworks display areas to be safe, then these happened,” he said. Citing the lack of adequate information, Duque theorized that the incidents may have happened due to possible mismanagement of the area or that the one that ignited the fireworks were not professionals.